The MigraPure products are the result of over 15 years of research and development including both in vitro and in vivo studies. This includes 4 clinical studies. The studies were all conducted by world class headache specialists with research and analysis published in top tier medical journals. The MigraPure products are patented for both the acute treatment of migraines and the prevention of migraines. Sublingual delivery provides fast efficient absorption. Avoids the degradation of the first pass effect caused by the stomach and liver. A little goes a long way! MigraPure is highly effective and very safe. Side effects profile similar to placebo. Headache/Migraine is the third largest reason patients visit chiropractors, behind back pain and neck pain. 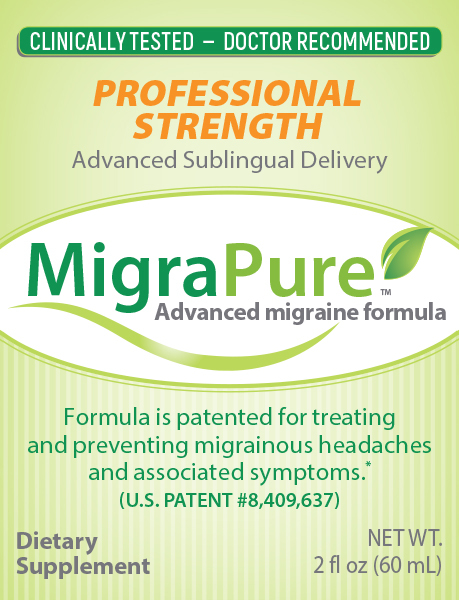 MigraPure products are available only through health professionals. Not available through retail stores. The MigraPureH hemp version provides the added benefits of reducing oxidative stress and anti- inflammatory activity. The hemp used in MigraPureH is legally imported from Europe and is legal in all 50 states. It is broad a spectrum, certified for quality and provides additional cannabinoids, terpenes and flavonoids. It also adds additional omega-3 and omega-6 fatty acids to enhance the olive oil base. Migraine Headaches are the Most Costly Brain Disorder in the U.S.
*FDA Statement- These products have not been evaluated by the Food and Drug Administration. This product is not intended to diagnose, treat, cure or prevent any disease.